Savings in energy- Saving in energy, chemicals and water is now vital for survival of any dye house. Machine vendors are now constantly redesigning dye machines that has the lowest liquid to goods ratio. For example a high pressure dyeing machine consumes much less water for processing. The liquid to goods ratio being 1:5 (i.e. to process 1 kilogram of fabric, five litres of water are used) now compare this to traditional units that are fitted with conventional winches whose water to liquid ratio is in the range of 1:15 or even sometimes 1:20. Survival for such dye houses is impossible. 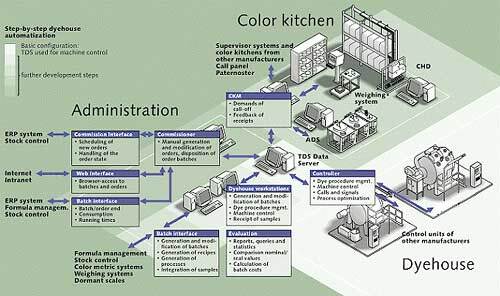 Maintenance- It is a general tendency to view maintenance time as an opportunity lost to manufacture dyed sales yarn. Preventive maintenance is clearly less expensive than unscheduled halt and a spoiled dyeing.